MUSIKMESSE 2017: Martin Guitar has chosen Musikmesse as the stage to unveil a classic 0-18 and two new 'highly affordable' Dreadnought models. 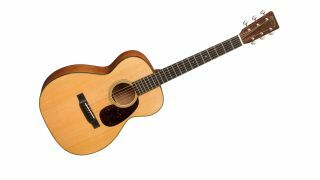 The 0-18 (above) is an addition to the Standard Series; a scallop-braced Sitka spruce top, concert-sized model with mahogany back and sides. There's a relatively short 24.9” scale with a modified low oval neck shape and high performance parallel taper designed to aid speedy playing and open geared nickel tuners with phosphor bronze strings and an ebony fingerboard and bridge complete the look of this classic parlor guitar. The new DST and DSTG (below), meanwhile, are Dreadnoughts designed specifically for the European market, according to Martin. Features include forward-shifted braces, an ebony fingerboard and bridge, and bone nut and saddle. Made in Nazareth, Pennsylvania , they're available in satin or full gloss finish with a tortoise colored headplate, binding and heel cap. They'll also come complete with Martin Studio Performance (SP) strings and a padded gig bag. We don't have confirmed prices yet, so we'll bring them to you ASAP. In the meantime, head over to the Martin Guitar site for more details.